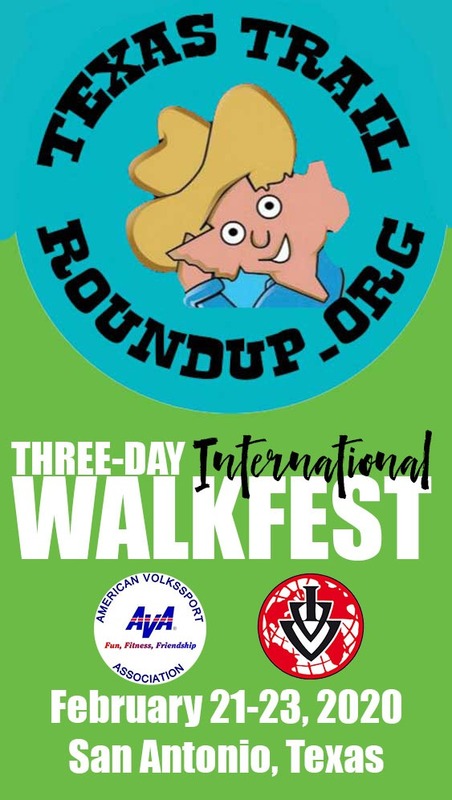 Friday’s friendship walks will take you through downtown San Antonio. Imagine what it looked like almost 300 years ago when the plans for the city were first laid! In 1573 the King of Spain, Philip II, decreed an extensive set of rules for the building of towns and cities in the Americas, known as “The Law of the Indies.” While these rules applied to many facets of colonial life, their main legacy has been the planning of Latin American cities. The Law of the Indies decreed that all new towns must have a central plaza surrounded by important buildings with portales or arcades, and from which the principal streets, laid out in a grid pattern, were to begin. Smaller secondary plazas were also called for as well as narrow streets to provide shade. 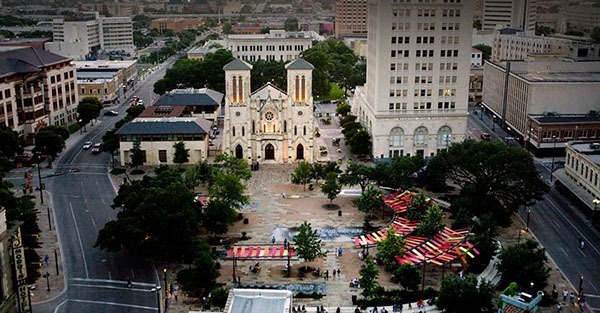 The 1730 plan for San Fernando de Bexar (San Antonio) drew on this tradition, beginning with the iglesia, the town’s 18th-century church that later became a cathedral. From its front door, surveyors marked off Plaza de las Islas (Main Plaza) and a set of radiating streets along whose flanks government buildings, stores, and individual housing would be built. The whole plaza was locked in a grid, forming a cross with the church as a center. In the late nineteenth century, railroads and trolleys allowed developers to create more distant suburbs, shifting where people lived, worked and shopped. The introduction of the automobile continued this trend. 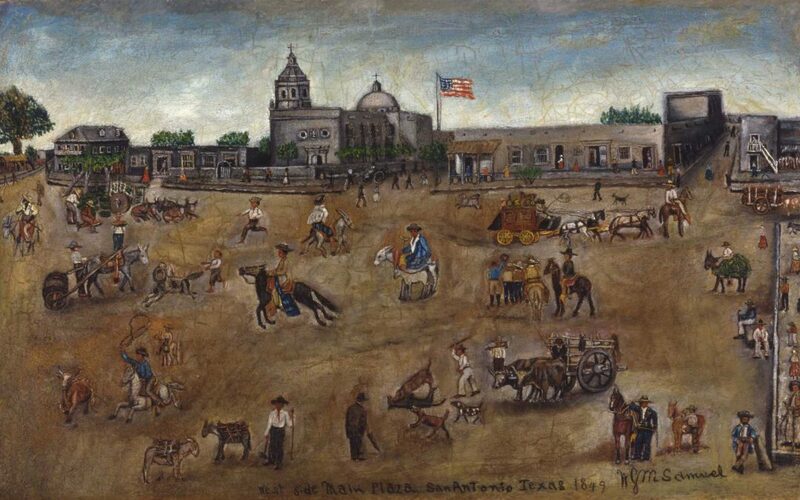 As the city swelled in size, the plaza itself shrank as a result of the widening of Market Street in the 1880’s and the construction of a new county courthouse that filled in part of its southern quadrant. As other tall buildings rose over the plaza its wide-open character and dirt-packed surface were also transformed. The center was elevated and planted with trees and grass, while the surrounding streets were paved. City hall, built in 1889-1892, filled Plaza de las Armas (Military Plaza.) 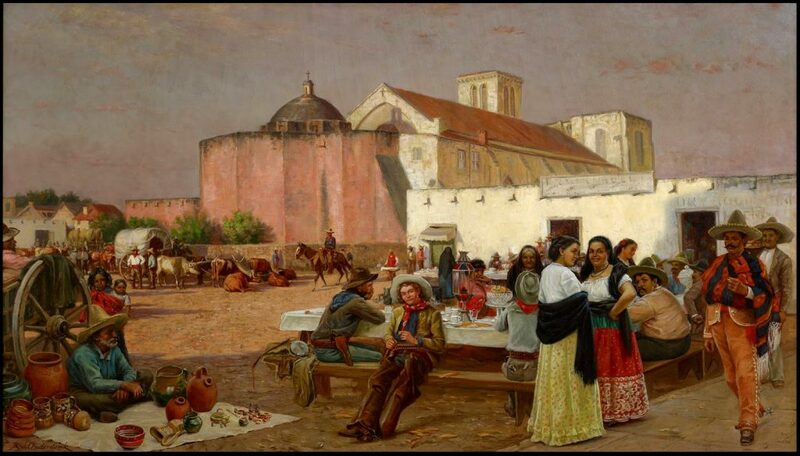 The famous “chili queens,” depicted in the 1880 painting by Robert Onderdonk, above, were banished. In 2006 Main Plaza began a major renovation. City planners sought to recreate its pedestrian character by knitting together the plaza, cathedral, courthouse, and the river. As you walk through Main Plaza, be sure to take note of the 30 pavers that describe historical events that took place on this very site.